I'm about to break your dear little heart. You see, NO food will actually cause you to lose weight. It's your overall diet that matters. These Nigerian foods for weight loss I'm about to reveal to you will only work their "magic" if they makeup majority of your Nigerian diet plan. ...AND... are eaten in the right quantity. Now the bitter truth is out of the way, let's get to the sweet part you've been waiting for. which act as natural fat busters and are found only on the outside of the fruit, according to researchers in Australia. Mango is even sold as a commercial weight loss supplement in the US where they don’t have mangos. Berries AKA 'tiny but mighty'–are full of antioxidants and fibre. Less I forget, they’re low in calories too. Studies have shown that the antioxidant, anthocyanin, found in berries can alter gene activity in fat cells, making it harder to gain weight. So, next time you want something sweet, juicy, and good for you, reach for blueberries, grapes, or strawberries –and don't feel guilty! Can I find berries in Nigeria?. Yes! In major supermarkets and farmers markets. Cool Bonus: DOWNLOAD FREE PDF of Calorie content of these foods plus over 100 more Nigerian Foods and drinks. Avocado is a unique type of fruit. They are rich in nutrients, minerals, fibre, and vitamins. Avocados are high in monounsaturated fatty acids, which can help to shrink belly fat. Half an avocado mixed with tomatoes makes a great breakfast. You can add avocado to your salad as well. “Extra Virgin olive oil” is probably the healthiest fat on the planet. Mad! but true – Fat CAN help you to burn fat. Olive oil contains a naturally-occurring chemical called oleic acid, which aids the breakdown of excess fats in the body. Also, the Polyunsaturated fats found in olive oil can delay hunger. You should start cooking most of your dishes with Olive oil if you’re trying to lose weight. Apples contain pectin–an ingredient that naturally slows digestion and encourages feelings of fullness. which helps you consume fewer overall calories without feeling deprived! Pears are high in the fibre pectin (natural fruit sugars), which has been shown to help suppress appetite and aid in healthy digestion. They are also good at eliminating unwanted water retention. So whenever you’re craving junk food, reach out for a pear to save you! Contrary to the popular belief, bananas contribute to weight loss NOT gain. Banana provides the body with Zinc (skin healing), filling fibre, potassium, etc. Banana helps you relieve water retention because of the high potassium content. Talking about potassium, make sure check out the next food on the list. Just half a melon contains almost twice as much potassium as bananas do, making it a low-calorie, high-antioxidant alternative that can help in the removal of excess fluids around the body. Watermelon (including seeds) has too many benefits than I can count on all my fingers and toes. A half cup of cooked plantains packs almost 3grams of Resistant Starch–a healthy carb that boosts metabolism and burns fat. If you want a good body then eating grapefruits is one of the best things to do. Grapefruit boosts metabolism and makes your body burn extra fat. It’s a great source of fibre, which balances your blood glucose level. If you don’t want to overeat, eating half a grapefruit about a half hour before your meals may help you feel full and eat fewer overall calories. Lemon is a well-known detoxifier. It’s a great natural weapon against water retention and could help you achieve a flatter stomach. Adding lemon to water is also great for weight loss (it makes you feel full and it doesn't contain any significant calories). Lemon juice also contains pectin – a type of soluble fibre that can help slow digestion, which is great for weight loss. Papaya contains a naturally-occurring enzyme called “papain”, which aids in protein digestion. It can also help in breaking down food faster, easing bloating and flattening out your belly in no time. Just like pawpaw, pineapple boasts a digestive enzyme that helps to ease bloating, settle down your stomach, and even relieve heartburn. It’s high in natural fruit sugars or fructose, which could keep off sweet cravings. This citrus fruit, which contains fat-blasting compounds known as flavones, deserves to be your main squeeze. Women who ate the most flavones had a much lower increase in body fat over a 14-year period, a study in The American Journal of Clinical Nutrition notes. Eat oranges sliced or squeeze fresh OJ (including pulp!) to get the best benefit from the fruit. Cucumber is a low-calorie vegetable that's rich in fibre and fills your tummy up quickly. If you are serious about losing weight then snack on cucumber or add them to your salads. Finally, they also contain antioxidants such as quercetin and apigenin that helps fight cancer and lowers your risk of heart diseases. Tomatoes are essential because they not only make your food taste better, they're full of antioxidants AND they help you lose weight. It has been found to help you lose weight by reducing inflammation and water retention in the body. Adding chilli pepper to your food can be useful for weight-loss because they contain a substance called capsaicin – which helps reduce appetite and make you burn fat quicker!. and twice your recommended daily allowance of vitamin C – an essential antioxidant that battle toxins and foreign bodies in the bloodstream. Okra is a vegetable high in fibre, which helps to regulate bowel function and encourage the growth of friendly bacteria in the belly. In addition, it helps stabilise blood sugar levels and lower high cholesterol, reducing the risk of heart diseases. Try cooking your okra soup with little oil, then you're good to go! Cabbage is high in vitamin C and antioxidants. Broccoli is rich in filling fibre and only contains 30 calories per serving. Also, it's a great source of calcium and an important cancer-fighting compound. And yes you can find broccoli in farmers market and major supermarkets in Nigeria! Carrots are not only juicy but are also high in fibre, which fills you up quickly. They also contain Vitamin A & K and they are good for your eyes. Try eating carrots as snacks in between meals for better eyes And body. True, potatoes are high in carbs, but potatoes aren't the enemy. A 2008 study found that potatoes are the food that helped people feel satisfied the most. Plus they’re also rich in Resistant Starch, which helps your body burn fat. Replace that white bread breakfast with potatoes because potatoes are three times as filling as a slice of white bread yet healthier. Sweet potato is one of the best foods on the planet! They are high in fibre and all sorts of vitamins than I can count on all my fingers and toes. Despite the name "sweet", they contain Blood-sugar-regulating properties making them a good food for diabetics. Yams are great weight loss breakfast options because they cook fast. They're rich in fibre which feels fill you up quickly and keeps you satisfied for a longer time. Oats are mainly made up of insoluble fibre. This insoluble fibre not only gives you a feeling of satisfaction that keeps you from feeling hungry for a long time but also does not contribute to any calorie addition to the body. If you can’t live without rice, then eat ofada or brown rice… a healthier version of white rice because they’re complex carbohydrate rich in protein and vitamins. It is also better because it contains a rich supply of energising B vitamins, which could help you burn calories faster. Nutrients including protein and fibre are packed in each tiny bean. Beans tend to contain some resistant starch, which stops you from feeling hungry for a long time, while the high protein content will help burn fat and keep your body toned. Try adding beans to your diet to shift your body into fat-melting mode. Almonds are packed with protein and also have high fibre content that stops you feeling hungry. In 2007, researchers at Purdue University also reported that – despite the fact they are relatively high in calories – almonds themselves do not contribute to belly fat. Snack on a handful of almonds in between meals and see a difference in your weight and skin. Coconut oil is high in fatty acids called Medium Chain Triglycerides (MCTs). Studies have shown that these fatty acids not only keep you satisfied for a long time but also increases the number of calories burned. Coconut oil still contains calories, so the idea is not drink coconut oil, but replacing some of your other cooking oils with coconut oil. Nuts have a bad reputation in the diet world but actually are excellent weight loss snacks. They containing balanced amounts of protein, fibre, healthy fats, heart-friendly omega-3s, and skin-conditioning vitamin E.
Eat a small handful of nuts as a snack in between meals if you want a flat stomach and a slim waistline. A 2011 study found that people who ate an ounce of nuts a day had higher levels of the "feel-good" hormone serotonin, which can act as an appetite suppressant. Higher serotonin levels may also help diminish stress levels — a big help when it comes to the fight against belly fat. Just make sure not to over eat it, as they are still pretty high in calories – one handful is perfect. because garlic is packed not just with toxin-battling antioxidants, but also a naturally occurring chemical called allicin. When digested, allicin reacts with the blood to create a product capable of killing off many harmful bacteria and viruses that your body may be harbouring – including in the digestive tract. Ginger has anti-inflammatory, anti-nausea and antioxidant properties, which helps to aid digestion. It also contains an enzyme called zingibain, which helps digest proteins. Start using ginger to spice up your food if you’re serious about winning the weight-loss battle. Whole egg (plus yolk) is one of the best foods you can eat if you need to lose weight. If you’re trying to lose weight it will be a good idea to add eggs to your breakfast. Yoghurt contains live probiotic bacteria that aid digestion and also helps to relieve bloating and discomfort in the stomach. Go for unsweetened yoghurt In between meals to help protect against inflammation and leptin resistance, which is the main hormonal cause of obesity. Turkey is a great source of lean protein. and we already know that protein in your diet is important when you're trying to achieve a balanced weightloss, since protein helps to preserve muscle mass and keeps you feeling full. Seafoods are jam-packed with all kinds of fat-burning properties, such as calcium and protein. Add seafoods to your diet because they are the perfect weapon against excess fat. Eating a lot of oily fish like mackerel is a good idea if you want to lose weight and belly fat because it's high in protein and low in ‘bad’ or saturated fats. Vinegar especially Apple cider vinegar is added to a lot of healthy food recipe because they are rich in vitamins and studies have shown that they can lower the glycemic index of high-carb foods like pasta. Adding vinegar to your meals (like salad) amongst many other benefits can keep you from feeling hungry. Where to get 'apple Cider Vinegar' In Nigeria? 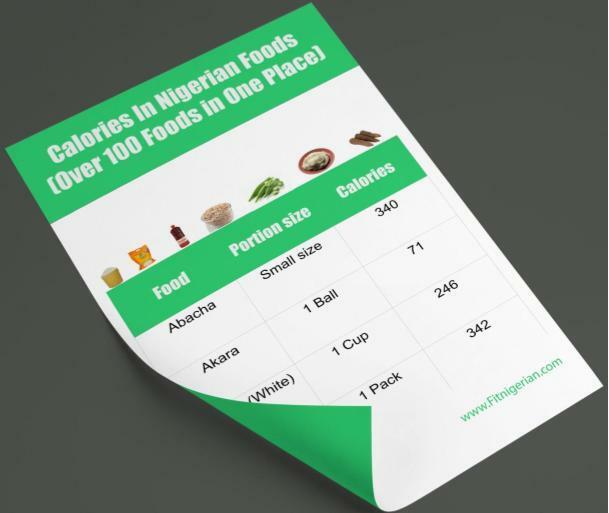 Don't forget to download the FREE PDF of Calorie content of these foods plus over 100 more Nigerian Foods. Just click on the image below.